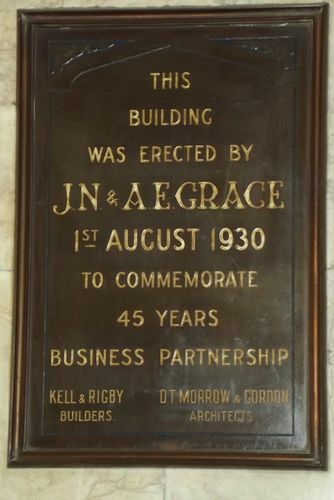 Plaque commemorates the erection of The Grace Building in 1930 to commemorate 45 years of business partnership between the Grace Brothers. The building, which is now the site of the Grace Hotel, was officially opened on the 3rd July 1930. Albert Edward and Joseph Neal Grace, were two brothers who migrated from England in the 1880s and sold goods door-to-door. In 1885, they opened their first small shop in George Street, Sydney and by 1906, they had opened a five-storey building at Broadway (now the site of the Broadway Shopping Centre). In 1931, Joseph Neal Grace died and Albert Grace became Managing Director of Grace Bros Ltd. Prior to his death in 1938, Albert Grace planned suburban expansion of the Grace Bros stores from the City, a move which is considered the reason Grace Bros survived when many of their contemporaries perished such as Anthony Hordern’s and Mark Foy's. Grace Bros.' new 13-story building in York-street was officially opened by the Lord Mayor (Alderman Marks) yesterday. The building is of steel and concrete, with glazed terra-cotta facades on York and Clarence streets, and from the high tower an extraordinarily fine view of the city and harbour is obtained. The large showroom was tastefully decorated, and contained an exhibition of furniture. In welcoming the Lord Mayor and party, as well as the representative attendance of city businessmen, Mr. A. E. Grace, governing director of Grace Bros., Ltd., said that the building was a tribute to Australian artisans, Australian architects, and Australian builders. It had been completed ahead of schedule, and it would stand for many years as a memento of the work of the firm of Grace Bros, in Australia. The Lord Mayor described the building as one of the finest pieces of architecture in the Southern Hemisphere. It was a tribute, he said, to the enterprise of Grace Bros., Ltd., and to the skill of the architects (Messrs. Morrow and Gordon), and the builders (Messrs. Kell and Rigby). The owners of the building first launched out in business in George-street West In 1885. Gradually they had marched onward until their emporium at the Broadway covered a floor space of 25 acres and housed a staff of 3000. The completion of this building acted as a coping stone to their career. Constructed at a cost of £500,000. it would be of inestimable value to local and overseas manufacturers because of its close proximity to the softgoods warehouses. The Sydney Morning Herald (NSW), 4th July 1930.